I can't think of anything better to do on Valentine's Day than go to the Jungle Theater and see a play about a horribly dysfunctional, but highly entertaining, married couple. 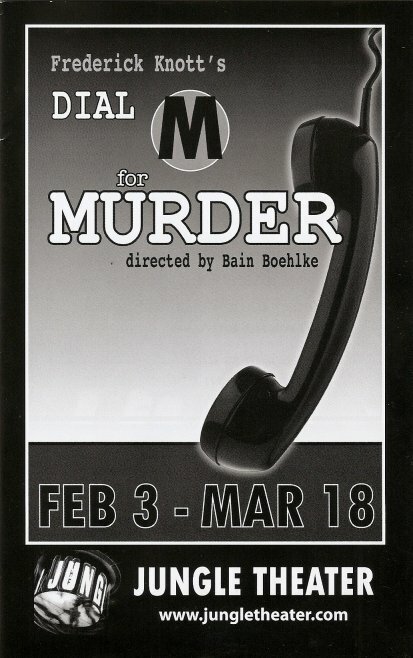 I'd never seen the play or the 1954 Hitchcock movie version of the classic thriller Dial M for Murder, but I did recently see the 1998 remake The Perfect Murder (thanks to the Viggo Mortensen auto-record on my DVR). So I vaguely knew what the storyline was, but I didn't realize just how delightfully it would play out on the Jungle stage. There's an undercurrent of tension and suspense throughout the whole play that's just delicious. Murder shouldn't be this fun. The entire cast just sparkles, speaking in British accents for this London-set story. Starting with Michael Booth as our hero/villain, Tony, a professional tennis player who married for money and develops an elaborate plot to kill his wife so he'll inherit her money. He's smart and smooth, and thinks he has every detail worked out. As things go wrong he continues to plot and scheme, and almost pulls it off. Cheryl Willis (aka Shirley Valentine) is the neglected wife and target of the plan, Margot. She's so naive and trusting of her husband, even though he did a complete 180 a year ago and suddenly became the perfect husband. Around that time she ended her affair with an American crime writer, Max (Terry Hempleman), who has just come back to town and is obviously the one who truly cares for Margot. She thinks the three of them can be chums, and Tony decides to use that to his advantage and work Max into his plan. He blackmails an old school friend (Peter Moore), who's already a bit of a con man and a gigolo, into doing the deed. Fortunately Margot is tougher than she appears and is able to fight off her attacker, but is not so lucky when her husband subtly schemes to have her charged with the crime. Gary Briggle, who says so much with just a grunt or an mmm-hmmm, is the Columbo-esque detective who can smell something's not quite right with this story, and doesn't give up until he's figured it out. I love moments of silence in a play, when there's such expectation and anticipation of what's going to happen next, and there are several such delightfully tense moments in this production. The play is directed by Jungle Artistic Director, Bain Boehlke, who also designed the set. I don't know of too many directors who design their own set, but who better than the director to know just what the stage should look like? And when you've got the talent to do both, as Bain does, it's a beautiful cohesion of story and environment. In this case the set is a detailed London apartment, complete with tennis trophies and tea sets, and the all important turnkey. I don't know if it's the way the theater and stage are structured, but at the Jungle I always feel like I'm looking into a very detailed and perfect little diorama that comes to life when the actors enter. This is the first production in the Jungle Theater's 2012 season (playing now through March 18), and they're off to a fabulous start. With The Birthday Party, Noises Off, Waiting for Godot, and In the Next Room (with some great casts already lined up), 2012 could be a very good year at the Jungle!